Garlic is a flavouring staple for many chefs but Australian cooks are now trying to spice things up with a new gourmet ingredient, black garlic. 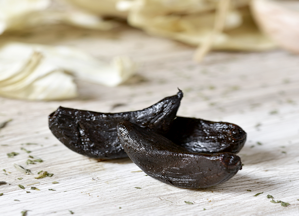 Black garlic is created when regular garlic is aged under specialised conditions until the cloves turn black and develop a sticky-date like texture. A unique rich but sweet and earthy taste is also created from the ageing process. Black garlic was first traditionally used in Asian cuisine but is now being used in a range of ways by chefs across the world. It can be utilised as a marinate or to help make more unique foods such as black garlic chocolate or black garlic ice cream. The garlic has even been added to energy drinks. “Chef’s in Australia recognise the amazing flavours and textures of the garlic which is added anywhere in the menu from a cheese plater right through to black garlic ice cream,” said Mr Pye said in video on his ReadyFundGo page. “It’s sweet, it’s like molasses balsamic vinegar and liquorice so the multitude of flavours is in high demand among chefs,” he said. Uncle Tobys Oats is now selling an ‘ancient grains’ oats option in Australian supermarkets. Sunny Queen Meal Solutions is now offering an egg-based dessert or snack option called Sweet Bites. Di Bella Coffee has launched its 2018 Reserve Limited Edition coffee blend.